Formal Charge is that pesky concept covered early in organic chemistry and somehow never seems to go away. Why do I call it pesky? Because the equation in your textbook is long, confusing, and needlessly annoying. How can you afford that kind of time when working through a multi-step synthesis? Yet understanding the nature of Formal Charge is a critical component when it comes to mastering organic chemistry reactions and mechanisms. Formal charge helps you understand reaction patterns by showing you why a specific atom attacks, and why its ‘victim’ accepts the attack. So what exactly IS formal charge? Formal charge is the actual charge on an individual atom within a larger molecule or polyatomic ion. The sum of formal charges on any molecule or ion results in the net overall charge. 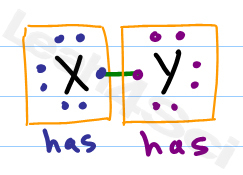 This concept is simple enough for small ions. Chloride obviously has a negative charge. 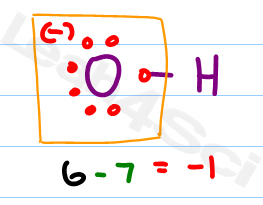 Even the negative charge on the hydroxide oxygen is simple to understand. But what if you have a much larger group of bound atoms with an overall net charge? 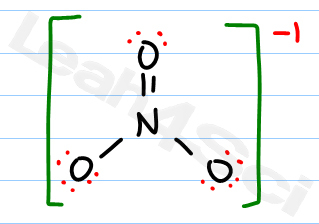 For example, the negative nitrate or triple negative phosphate. Where does the charge come from? Which specific atom is responsible for the overall charge? Can it be more than one atom? And, what if you’re studying an uncharged molecule – Is it still possible for individual atoms to carry charge despite the net neutrality? The answers are yes, yes, yes, and more yes. Think back to general chemistry when you studied ion formation. An ion is simply an atom or molecule that gained or lost electrons to get a net charge. If the atom has just one more negative electron, than protons, it will have a net negative charge. If the atom loses negative electrons and therefore has as few as one extra POSITIVE protons in its nucleus, it will carry a net positive charge. Now that you know WHAT we’re studying, let’s see HOW! – That’s where I can help you. When I first studied formal charge I was lost. The formula in my textbook was long, tedious and brutal. A long, annoying trip to my professor’s office hours enabled me to figure it out, but it was still overwhelmingly TEDIOUS! Let’s start with the proper formula and then learn a shortcut. Valence electrons = corresponds to the group number of the periodic table (for representative elements). Lone Pairs = lone electrons sitting on the atom. Each electron counts as one and so a pair counts as two. ½ # bonding electrons = Since a bond is formed by sharing 2 electrons between 2 atoms, every atom in the bond can only take credit for one of the 2 electrons. 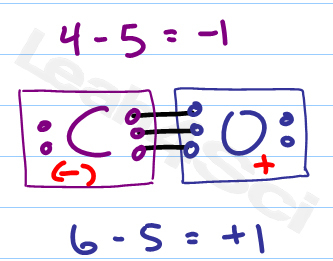 A double bond containing four electrons allows each atom to claim 2. A triple bond of 6 electrons allows each atom to claim three. Do you dread running through this every time you finish a reaction? Yes the equation works, but it’s far too tedious and annoying! There are just too many steps and calculations. Here another option, MY version – one that is easier, faster, and comes out with the same result! Here’s my version of this equation. This shortcut is guaranteed to save precious seconds on your exam IF AND ONLY IF you understand how to apply it. But when you understand it you’ll be able to solve formal charge in your head, in under 8 seconds per atom. Should = the number of valence electrons that a neutral atom SHOULD have. Has = the number of electrons an atom HAS directly attached, touching the atom in question. Each bond only counts for a single electron since the second electron in the bond is touching the other atom. When you first study formal charge it helps to draw out the Lewis Structure for every molecule in question. As you get more comfortable with this topic you’ll be able to pick out bonds on skeletal bond-line drawings. Let’s start with an easier example. 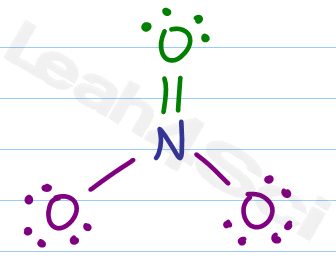 We’ve already discussed hydroxide so let’s take a look at the OH- Lewis Structure. Following the checklist in the Lewis Structures video we have oxygen bound to hydrogen, with 3 lone pairs around oxygen. Here’s a trick for bound hydrogen, it ALWAYS has a formal charge of zero, so just ignore it. Hydroxide has a negative formal charge on the oxygen atom. Following the checklist we draw our atoms, bonds, and electrons. Due to resonance we would show three structures for nitrate. However we’ll just look at one for the sake of our experiment. 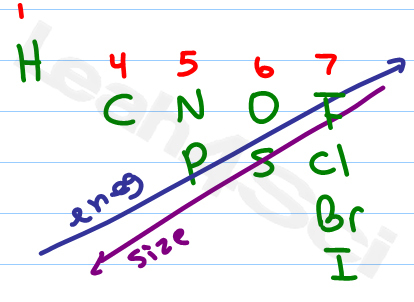 Neutral nitrogen should have 5 valence electrons but our drawing only shows 4 attached. Next we’ll look at the double bound oxygen. The double bound oxygen is happy, stable, and has a net neutral charge. Finally we have 2 single bound oxygen atoms with 3 lone pairs each. Since they are identical we have to calculate just one to get the answer for both. 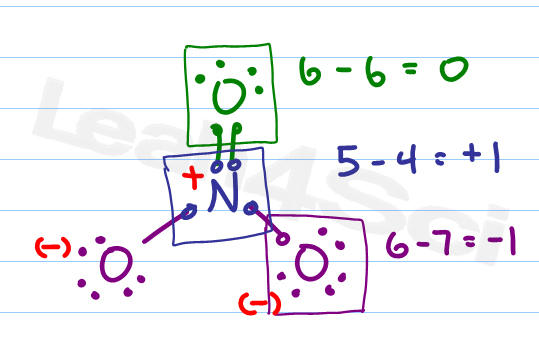 Oxygen should have 6 valence electrons, each of the remaining oxygen atoms have 7 attached electrons for a net negative charge. Let’s try one more simple yet tricky example. Carbon monoxide. Simple because it only has 2 atoms. Tricky because carbon monoxide is neutral, but don’t let this fool you. Many a hemoglobin has been fooled by CO making it such a deadly poison. molecules with formal charge that cancel out for a net zero formal charge. Now let’s tackle the individual atoms. What do you think? Do you still find formal charge as tedious and daunting as you did when you first learned it? Hopefully the shortcut ‘should – has’ gives you the confidence to simply stare at a molecule and come up with instant formal charges. Formal charge concept was bouncing over my head and now it’s over.Thank you for this easy trick. This should – has formula is great. But i’m having some problems with NO3-. In NO3-, one oxygen atom is bonded with nitrogen atom – one sigma and one pie bond. But there is a coordinate bond between N and the other O atom. so the formal charge on O should be= 6-(6+2). It should be -2. So how come it is -1? Can you clear my confusion pls. Formal charge was frustrating me for a long time,but after this “should-has” technique I feel like a burden is off my head. Thank you very much for your fantastic trick. so one atom can be negative and the other positive, such as in (CH3)3NO. what would the overall charge be on that compound? To find the overall or net charge, simply add up the individual formal charges. Thanks now am going well with this series of tutorial but I need more different questions to make me practise on lewis structures and formal charge as well. I agree Ally. I’m planning to add a quiz to this post down the line. For now refer to your textbook and look for as many problems as you can find to drive this topic home. How would you work that out for N NH2 ? Suppose I take 5 electrons as ‘should’ and 1 electron from each Hydrogen which makes ‘Has’ 7. So, the formal charge on Nitrogen becomes -2 but it should be -1. Please tell me what I am missing? I’m not sure I understand your question. Is your molecule N2H2? Or the N in NH2, and if so, first give everything their complete octet. Then determine that nitrogen should have five, hydrogen should have one, that’s twelve total. Count how many you have around each. Twelve will include bonds. But whatever is touching directly is considered in your formal charge calculation. I’ve never seen a trivalent oxygen …how do u explain this? Please find me the Bond order of ozone?? ?| Thanks!